Well thanksgiving was pretty fun. Despite being tired from work, I had a good time and the food was delicious. While waiting for the grub me and Sam T. went and snagged my GPSr and looked for some nearby geocaches. The first one we found was just outside of a graveyard (they dont allow you to put them inside specifically, out of respect). It was a little tough to find and required some climbing, but the more effort the more satisfying it is to find. When we found it, i signed the log saying i was there and inside were some items you can trade for. 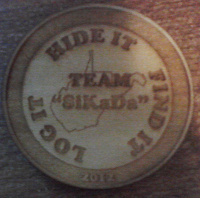 I snagged a pretty cool wooden coin, which i later found out is a 'signature item' people left behind basically stating they were there and found it. I really like the idea, and I am thinking of one for myself. We found two other cache, one stuck to a guard rail with a magnet, that despite being a blind bat, Sam spotted before me. Than we went to a level 2 (difficulty is 1-5 on caches), and it took us a long time to find this one. We both actually guessed where it was right away, but it was so cleverly disguised (and a bit covered in leaves) that we didn't see it. I went back and looked very closely after searching, and finally seen it. Just a logbook in this one, as the cache was small. Still very fun! I look forward to doing more geocaching soon, and putting our own devious creations out. Made in the USA possible?